A customer recently asked us “where can i buy a sim card in Ho Chi Minh City?”. We always do a lot of research when we get a question like this from a guest. We were actually really surprised to see that quite a few people had been taken advantage of by purchasing sim cards from random tourist kiosks in the airport. If you are looking where you can buy a sim card in Ho Chi Minh City you should only purchase from reputable suppliers at their shops or kiosks. I recommend buying from Viettel or Mobiphone at their locations inside the city or their Kiosk inside the airport. These companies are the two biggest networks in Vietnam so you can have some of the best coverage available. Random shops or kiosks aren’t certified to give you a sim card, so avoid these suppliers at all costs. Where to Buy a Sim Card in Tan Son Nhat Airport? The whole reason for writing this blog article is to hopefully help a few people that are looking at buying their sim card inside of the airport before getting onto the street. After being on a long flight I know that most of us are ready to connect online and let everyone know that we arrived safe and sound to our destination. Also, it’s a comfortable feeling to be able to look up answers to questions you might have when trying to get to your accommodation. It didn’t take very long when doing research on Sim Cards to see that so many people have been taken advantage of when buying a sim card in Tan Son Nhat airport. The biggest scam it seems is that sim cards that work for just a short amount of time and then are shut down after 7-8 hours. This is why my piece of advice for getting a sim card is to ignore all of the other Kiosks except the official Viettel and Mobiphone Kiosks. These companies are the only recommendations I am going to make in this article. If there is another kiosk offering a sim card for a few dollars less, I personally wouldn’t even consider it. The headache of getting a sim card that stops working way before its supposed to isn’t worth it. Where are the Viettel and Mobiphone Sim Card Kiosks in Tan Son Nhat Airport? These Kiosks are located after you get out of customs. That means you’ll have to wait until you go through immigration in order to get to the correct Kiosks. In our research we found that the biggest complaints about being ripped off happened at the kiosks before immigration so we highly recommend you avoid these options. The Viettel and Mobiphone kiosks are located at the exit of the terminal after baggage claim. You’ll be able to see that their brand name is prominently shown on their Kiosk. Where to buy a SIM card inside District 1, Ho Chi Minh City? If you aren’t going to buy your sim card in the airport. You can seek out the official Viettel and Mobifone stores. Viettel and Mobiphone have a few locations in District 1, we recommend making a trip to their stores to buy a sim card directly if you didn’t buy one in the airport. These locations are always quite busy, so it could take a little while to be helped. You can rest assured though, if you buy your sim card from here it will be fully functional and official. Which Sim Card should you buy? I believe hands down the best network is gonna be Viettel. I have used mobiphone for my entire time in Vietnam, but looking at the coverage for both Viettel and Mobiphone it is easy to see which one has the superior network. 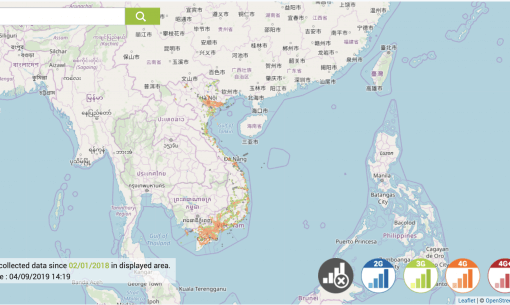 Viettel has much more 4g coverage spread across the areas of Vietnam. Mobiphone’s coverage isn’t bad but their 4g network isn’t as large as Viettel. What are the requirements to buy a sim card in Ho Chi Minh City? In 2016, there was a crack down on agency enforcement to prevent the illegal sale of sim cards. This was due to issues with phone scammers and national security. This means that all sim cards require an ID or Passport to be registered. If a sim card is sold without the request of your passport information, you can bet that this isn’t an official card or there is something fishy going on. How much do Sim Cards cost in Ho Chi Minh City? There are a few different plans available for tourist sim cards. You’ll have the option to choose just data if you don’t think you’ll need to make any phone calls during your trip in Vietnam. The price range for a few Gigabytes of data will range from 200-300,000 VND. Everyone’s phone usage differs but a few gigabytes of data should be good enough for a 2-3 week vacation in Vietnam. Can I top up a Sim Card that I bought? Topping up a sim card in Vietnam is extremely easy. You can buy a scratch off card for both Mobiphone and Viettel from most any small mom and pop shop and convenience store in Vietnam. If you get a number from a convenience store it will come on a receipt instead of a scratch off. Type *100*, then your number on your scratch off or receipt, and then the # key. You’ll receive an sms from the carrier to let you know they received your top up. We hope this information has helped you when you go to buy a proper sim card. Traveling around with a good connection to the internet is important in a country where you don’t speak the native language. Hopefully you have a great time in Vietnam with some full bars on your phone!